A business trip? Just passing through? A visit to Wiener Neustadt? 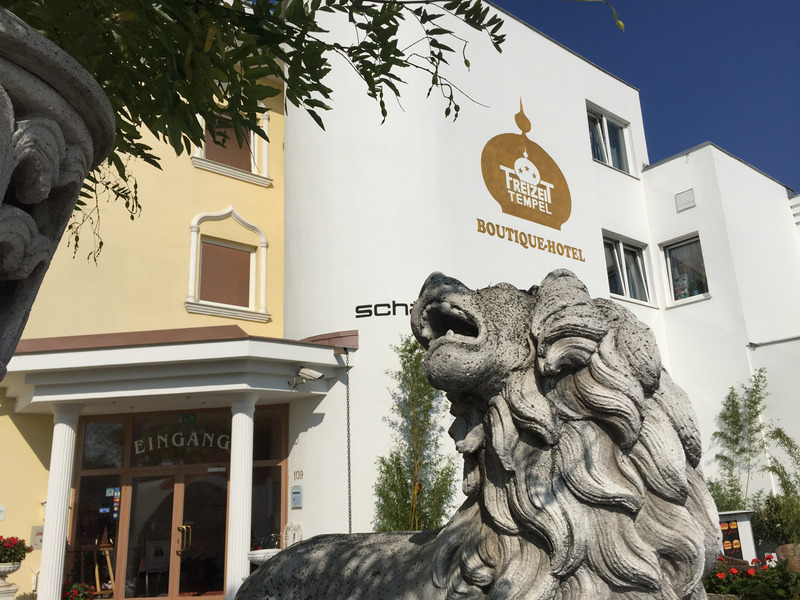 "Boutiquehotel Freizeittempel satisfies all wishes." The light and pleasant rooms in Boutiquehotel Freizeittempel are furnished stylishly and comfortably, offering bathtub or shower/WC, minibar, telephone, flatscreen TV (air condition where possible). For our guests internet is available free of charge. Via Wi-Fi easy log-in to laptop or mobile phone is possible. All our rooms are equipped with a smartphone enabling calls foc (EU, CH, USA, ZA, RU, HKG). It can also be used for mobile internet outside the hotel building. Massage, Thaimassage, Bow Tech, Frisurenstudio, SchoberArt - Photographic Studio, Crossfit Wiener Neustadt, Bodyfit. Getting strong for the new day! Our breakfast buffet is at your disposal Mo - Fr 06:30 - 10:00, Saturday and Sunday 08:00 - 11:00. You can enjoy various types of coffee, freshly brewed, or one of 12 different brands of aromatic highland teas. As a sweet finishing course we offer fresh Belgian wafers with maple syrup, Nutella (hazelnut cream) or (local) honey. Relaxation is available in the comfortable atmosphere of our sauna and/or solarium, while fitness and relief from stress can be found in our fitness studio where also Aerobic lessons are on offer. Enjoy the lovely ambiente of our Café-Bar with cocktails, coffees, teas, cool drinks and snacks! JAM – our Summer Bar is open from 1/6 to 30/9. All infos on opening hours, drinks and live events under thejam.at. Location – ideal for business and culture! Public transport to the city centre is available; a journey by car takes about 5 minutes; and of course there is still the possibility of a foc bike rental (for guests only!). 2 minutes by car to Arena Nova (events, exhibitions, Aqua Nova, MedAustron, TFZ Technology and Research Centre, Advanced Technical College). 2 minutes by car to Cine Nova (Restaurants, Cinema, Entertainment). Living/dining area with fully equipped kitchen including dishwasher and washing machine, TV, sofa-bed, luxurious bathroom with tub and walk-in shower. Prices in € per room and night incl. VAT (prices valid as per 1.1.2019). Included parking facility, W-lan, use of fitness rooms and sauna during opening hours. Bookings must be confirmed in writing in order to be binding. The room will be held until 6.00 p.m. Please notify us in case of arrival later than 6:00 p.m. In case of non-arrival the entire amount will be charged. The general terms and conditions for the hotel industry in Austria apply (ABGH 2006).